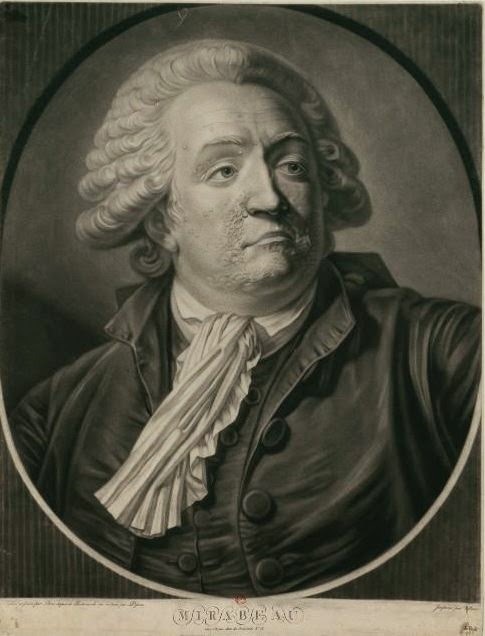 Claude-André Deseine, sculptor of Robespierre, was born deaf. He was an early pupil of the French pioneer of sign language teaching, the abbé de l’Epée, and justly proud of his achievements as a deaf-mute artist. In 2012 visits to the Conciergerie themed on "Claude-André Deseine and the French Revolution" formed part of the abbé de l’Epée tercentenary celebrations. Claude-André Deseine was born on April 12, 1740, the oldest of fifteen or more children of Louis-André Deseine, a master carpenter and his wife Jeanne-Madeleine Potier. In 1777, a few weeks after his father's death, when he was aged thirty-seven and now potentially head of the family, he appeared before the Châtelet Court in Paris accompanied his mother, two of his brothers, four uncles, two cousins, and a family friend; they were "unanimously in favour of the ban of Sieur Claude Deseine, deaf and dumb from birth, as being incapable of managing and administrating his person and possessions." Guardians were duly appointed. However, Deseine was evidently capable of some communication at this time; on a separate piece of paper the judge had personally struck out the words "cannot know how to read and write" and replaced them with "does not know how to read or write". See Lang, p.89-90. Lang concludes: "Thus, a single scrap of paper summarises well the fate of Deseine and many other deaf persons of his era left to the discretion of others." It is not known for certain when Deseine attended the abbé de l’Epée's school for the deaf. On 30th July 1791 he presented the National Assembly with a bust of his teacher and was described in the official record as "élève de la maison des sourds-muets". In a letter of 1773 the abbé mentions a one of his pupils, a worker in a sculptor's atelier who was able to make himself understood, though deaf-mute, thanks to his lessons (See Denis, p.6). The bust itself is dated 1786. Websourd has a nice anecdote from the historian Yann Cantin about Deseine clandestinely creating the preliminary model in class, but 1786 seems too late for him to still be at the school. In other versions he attends the abbé's masses. 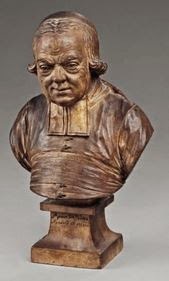 The story is probably inaccurate, intended chiefly to bolster the abbé's reputation for modesty; in all likelihood he simply posed for the bust. Records of Deseine's work as an artist begin to appear soon after his father's death. In 1778, he is known to have been studying sculpture at the Académie Royale in Paris under Pajou, alongside his younger brother Louis-Pierre. In that year both brothers appear among the Academy's prize winners: Claude-André was awarded a third medal, and Louis-Pierre the grand prix. In 1782 Deseine exhibited five sculptures at the open Salon de la Correspondance on the Rue Saint-André des Arts, including busts of the baron de Besenval, the vicomte de Ségur and the comte d'Argental . He also made a bust of the duc de Richelieu in 1785 - indicating that his work was highly respected enough for him to receive private commissions. His exhibits were commended in the Nouvelles de la République des lettres et des arts for their antique manner, artistic form and resemblance to their subject, the writer adding that "the artist deserves all the more praise since he is unfortunate enough to be deprived of hearing and speech". When the Revolution lifted restrictions, Deseine was able to exhibit in the annual Louvre Salon itself, showing four works in 1791 and more than a dozen in 1793. He is listed at this time as living at the hôtel des Écuries d'Orléans, rue de Provence, a property belonging to the duc dOrléans. It might be noted that one of his 1791 exhibits was an "Allegory of Liberty, with M. d'Orléans" - further suggesting a link to the duc's entourage and thus going some way to explaining Deseine's enthusiasm for the Revolution, which was in marked contrast to his brother Louis-Pierre's staunch royalism. Deseine's first notable Revolutionary portrait was Mirabeau. Following Mirabeau's death on 2nd April 1791, Houdon had immediately made his deathmask but, rather than give him the commission for a bust, the Jacobins threw open the project to competition. Deseine was one of four entrants and he carried the prize, his plaster bust being judged "a perfect likeness, with expression and energy". Deseine's work too was modelled on a deathmask: according to the Affiches de Paris a deputation from the section Grange-Batelière obtained permission for Deseine, "a deaf mute sculptor, known for his talents" to take an impression of the dead man's face (quoted Lami, p.275). Inscribed "Fait par Deseine sourd muet 1791"
The original plaster bust was acquired by the Musée des beaux-arts in Rennes in 1877. As noted, in December 1791 Deseine attempted unsuccessfully to present his busts of Pétion and Robespierre to the Jacobin Club. He was in no way discouraged and continued to offer his work to the Convention - a Lepeletier de Saint-Fargeau (11th April 1793) a Marat (6th August 1793) and a Mucius Scoevola (Jan 1794). None of these sculptures are now known. On offering the Marat, he asked the Assembly for financial recognition: although he had already presented four busts, he had received no remuneration and was not even able to obtain the lodgings at the Louvre which had been awarded by decree to artists of recognised merit; he had the right to consideration "both because of his infirmities and because of his talent" (see Lami, p. 274). On 14th nivôse Year III the Committee of Public Instruction awarded him a gratification of 2,000 livres. After the fall of Robespierre, Deseine disappeared from view and never again exhibited. He lived into his eighties and died on 30th December 1823 in a modest pension in Petit-Gentilly, just outside the barrière de l'Ourcine. Only a fraction of Deseine's works can now be identified. Here is a list of the very few in public museums which can be found on the internet. Busts of the ambassador Mohammed Osman Khan and his nephew, terracotta, 1788 . Louvre. 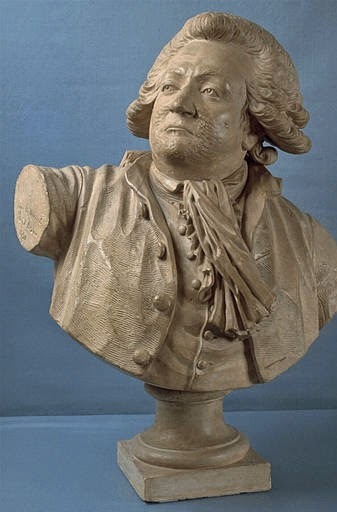 comte de Mirabeau, plaster, 1791. Rennes, Musée des beaux-arts. - Copy made in biscuit porcelain by Baverstock et Cie, rue Amelot. Boston Museum of Fine Art. Antoinette Gabrielle Charpentier Danton, , 1793. Original plaster, Musée des Beaux-arts, Troyes. Plaster with bronze coating, Musée de la Révolution française de Vizille. "Deseine, Claude-André" in Stanislas Lami, Dictionnaire des sculpteurs français au XVIIIe siècle Vol. 1 (1910) p.273-5. Theophile Denis, "Deseine: sculpteur sourd-muet, élève de l'abbé de l'Épée"Revue française de l'éducation des sourds et muets(1889) 5(1) p.5-6; 5(2) p.29-37. Thank you for the kind comments. I haven't managed to find any further illumination on your painting, I'm afraid. I think the resemblance to Marat is probably just a coincidence. 1776 is a long time before the Revolution: Marat probably looked quite different then.